As part of the postmodern turn in the study of history, the focus on space (alongside the usual questions of who, when, why) has become a mainstream topic of study. Justin Coulson summarises some of the latest studies to involve spatial data and in particular looks at how the digital is helping to transform what can be achieved and discovered through such studies. Coulson notes current projects such as Locating London’s Past and Mapping London – both of which use geo-referencing to create accurate maps of pre-modern London. Then there are postgraduate and postdoctoral studies such as Tim Bishop’s use of the Antwerp Alderman register to enable him to create an accurate map of the property boundaries in the fifteenth century city. At the University of York, Gareth Dean is using tenement records to spatially understand nearby Swinegate, whilst Nick Holder is locating London friaries and their development through time. Carley Dearing (Liverpool) is creating 3D maps of medieval Winchester and Marlas Craine is employing ‘space syntax’ to understand public spaces in the nineteenth century. 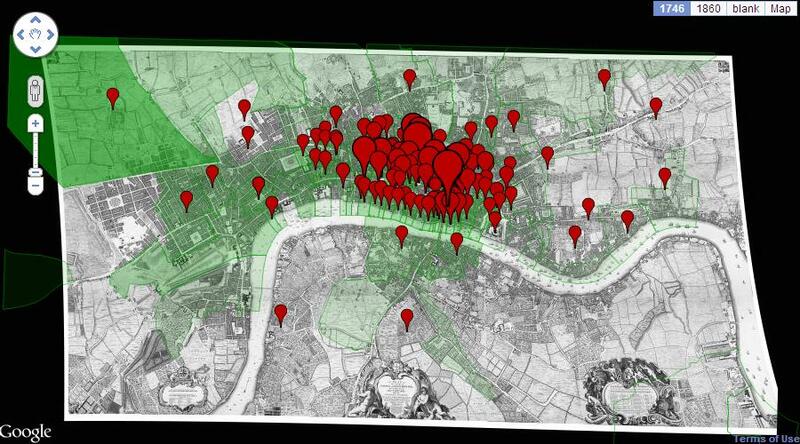 Coulson’s own research is focused on neighbourhood in medieval London. Early modernists claim that the rise of the self (amongst other things) led to the decline in neighbourly activity that had previously existed. However, this previous existence of a neighbourhood community is generally taken for granted and has yet to take on any properly understood shape. Coulson therefore has sought to use spatial technologies to find out to what degree there actually existed a neighbourhood in late medieval London. To achieve this Coulson needed to find out who lived where and map this onto an accurate medieval layout of the city. Traditionally there has been a simple split in scholarship between social science approaches based on quantitative sources on the one hand, and humanities based approaches based on textual sources on the other. If you were interested in the former then IT had much to offer to help with your analysis, if however, you were interested the latter then IT offered little and you would instead stress the close reading of your texts. This cosy dichotomy is falling under threat because increasingly large volumes of texts are available in digital form and close reading is no longer a suitable approach for understanding all of the huge volumes of material that are now available. Unfortunately we know little about how to analyse texts in an IT environment in ways that are able to cope with both the large volumes of material – potentially stretching to billions of words – together with the traditional need within the humanities to stress detail and nuance. This paper presents some initial results from a European Research Council funded project Spatial Humanities: Texts, GIS, Places that explores how Geographical Information Systems (GIS) technology can be exploited to help us to understand the geographies within texts. It is based on two examples: one drawing on early literature from the Lake District, the other from a much larger collection of census and vital registration material drawn from the Histpop collection (www.histpop.org). To listen to this live stream on Tuesday click here. If you suggest using GIS (geographical information system) to an historian they might look back at you blankly or with a look of mild horror on their face. For many historians GIS is viewed (not unfairly) as a complicated tool best left to others. However, its potential usefulness in answering and revealing research questions is pretty much indisputable. Richard Rodger wants to show that working on the spatial does not necessarily require GIS work and where it does, it is often highly rewarding. In this paper Rodger wants to look at alternatives to GIS, to more simple processes for investigating the spatial. He does this not just with the academic historian in mind, but also the local historian, the student, and other interested researchers. Using pre-established geo-referencing tools and by following straight forward techniques can be highly rewarding and relatively easy to learn. Take the Google Maps platform as an example. Rodger describes in this paper how to use Google tools to map spatially various statistical data with minimum of effort. Then there is his own project, Visualising Urban Geographies, which uses Edinburgh as a template for building mapping tools specifically designed for use by historians. By investigating data by addresses or districts, this project allows historians to create spatial boundaries to link maps to the boundaries of data. In other words a set of district records can be mapped accurately and displayed in a way useful for interpretation. Rodger wants everyone to be able to investigate the spatial and emphasises that it does not necessarily need to be complicated or time consuming. To listen to this podcast/video please click here.